Some of these songs sing of the 'terrible beauty' Yeats wrote about. Others sing of love, homesickness, emigration, the music and the craic. 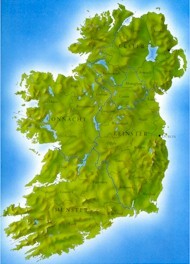 All of them are sung in Irish homes, halls and pubs or wherever in this world Irish people and their friends gather. They reflect the spirit, traditions and history of the Irish people. All the following song lyrics coincide with the similarly titled song on the "Irish Midi Files" page. Aside from displaying the actual lyrics, they will also inform the user what the introduction is, where there are breaks, changes, instrumental verses and/or choruses, how the song ends etc. So feel free to use the lyrics either on their own or along with it's associated midi file. "If you're gonna sing a song, sing an Irish song"
For Midi Files of the above song lyrics go to "Irish Midi Files "
To download a MIDI file, lyric sheet or image, right click on the object and then click on one of the options offered ( save picture as; save target as etc.) and download it to a place where you know you will find it. Also give it a name you'll remember. Prior to going on the Internet it is always advisable to open a new folder preferably on your desktop to download to and maybe give it a name associated with what you're downloading eg. "Irish Song Lyrics".